Our Free Security extension is developed, Mageplaza with the aim to help online business doers, especially Mageto merchants to deal with the possible attack from bad hackers. Among several highlighted features included in this extension, Security Checklist plays an important role in protecting the store activities successfully. First, from the Admin Panel, shop admins have to navigate System > Security > Checklist. Then, a list of protection criteria will be shown with their statuses: success or not. In this checklist, there are four contributing parts namely Check Admin’s Username, Check Captcha, Check Magento Version, and Check Database Prefix. With each criterion, if it is suitable or secured already, a green tick will be marked at the beginning of this criterion. If there is any element which is not secured and contains risks, a red cross will be presented before this element. In this section, there are a list of usernames used by store admins which are considered to be easily guess by hackers. Also, usernames, which are usually used by several people and not secured, will be shown in this section as well. Therefore, the extension lists out these names to encourage store owners to change their usernames. If you want to know whether your store is being targeted by hackers, you can use Login Log feature to get to know all login activities at your stores. If there are several failed attempts with these typical usernames, it is possibly that your stores are facing the risk of being attacked by hackers. This criterion has the function of checking whether captcha is turned on in the backend or on the frontend or not. If store owners already activated captcha, a message with green tick will be shown. If captcha is not turned on in any place, a red cross with an alert message will be displayed. See how Magento 2 google recaptcha utility works? 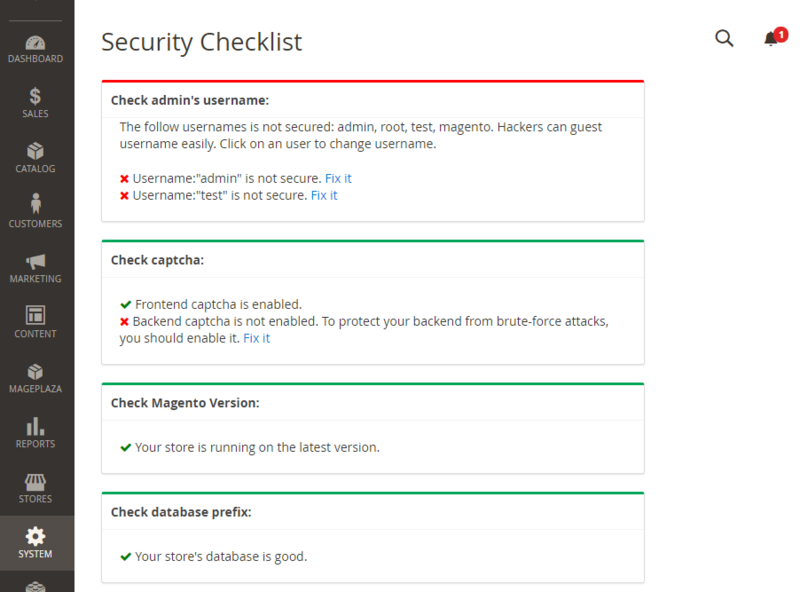 In this section, Magento Security extension has the responsibility to check the Magento version which is in use by store owners. If this version used is not the latest version, a warning message with a red cross at the beginning will be shown to notify shop admins to update the latest version for their stores. In case the version used is the newest version, a confirm text will be sent with a green tick to let store owners know that they have the latest version already. The function of this criterion is to make sure whether store owners already use database prefix. If not, a note will be shown in the checklist to inform them. Consequently, encourage them to use database prefix to put their database in a secured place. If the store is already applied database prefix, the system also inform them that their database is function well now.